Lord Vishnu has mesmerized mythologists, historians, religious people, script writers, et al since ages - he is a prolific character who lived life on his terms. A master manipulator, he would take multiple rebirths and influence people to act as per his wishes. 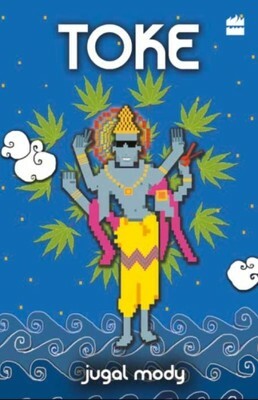 In this book, Vishnu is the 'cool dude'. He wears his traditional outfit of yellow satin, jewellery, etc and travels on his throne among clouds. He consumes drugs with the protagonist, Nikhil and his friends - now that is completely insane, isnt it? Jugal Mody, the author, has framed his plot in an interesting manner. Utterly bugged with his immediate senior at work, Nikhil joins his friends for marijuana and has hallucinations. Vishnu entrusts them with the responsibility to save the world so that he himself can hold up his tenth and final reincarnation. The reader is taken on a wild ride of imagination - apart from human beings and Lord Vishnu, there are a talking crow and eagle! You would need to concentrate on the book while you take in the proceedings, or you may get lost in some parts. But one must commend the author for such creative thinking. A 3/5 from me. have been in two minds for awhile now on whether to buy this book or not.. I would not recommend it, actually. You can borrow a copy and read it; but not invest on it. Would love to know your take on it!